Never heard of Troy Daniels? Join the club. But this rook's clutch 3 just saved Houston's season. PORTLAND, Ore. -- They keep score in the D-League the same as they do in the NBA, but the things that matter are very different. If you want to keep playing, you absolutely must keep shooting. No matter the game or opponent, no matter the situation or the game plan. If you want to have a job the next day, you must be aggressive. Unemployment is for the timid. And so it shouldn't have been all that big of a surprise that when the ball found D-League call-up Troy Daniels with the score tied and just 11 seconds left on the clock at the end of overtime of the Houston Rockets' 121-116 win over the Portland Trail Blazers on Friday night, he just did what he's been doing all year to keep eating. There was no time for Daniels to consider how amazing it was that he was in that position when Jeremy Lin dove on a loose ball, got up and found him on the wing for a wide-open 3-pointer. 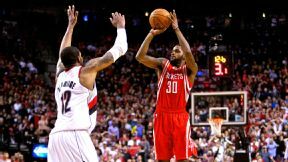 Craig Mitchelldyer/USA TODAY Sports D-League call-up Troy Daniels might have been the last player the Rockets thought would hit a game-winning 3. There was no time for him to think how much was on the line in that moment. That a Rockets team that began the season with the highest of expectations after landing Dwight Howard as a free agent was now placing its playoff hopes in his hands. That the legacies of Howard and superstar guard James Harden now depended in part on his making that shot. "To be honest, I wasn't thinking about anything but hitting that shot," Daniels said. "I had a couple game winners in high school. Not college. But now I have one in the NBA." Harden, who'd carried the Rockets with 37 points in this one, shook his head as Daniels spoke. "This is a little bit different than high school, right?" Harden joked. Daniels smiled, but what if it really wasn't all that different? What if the loose, shoot-or-starve attitude that D-Leaguers like Daniels bring with them to moments like this is exactly what these Rockets needed? All series long -- heck, all season long -- Houston has talked about a need to be aggressive. Play downhill with "thrust," as Harden terms it. Play loose and fast. Think less. When the Rockets are rolling, that's how they are playing. Harden glides through the defense and past picks like a super-G slalom skier. Howard rolls to the basket for thunderous alley-oops. Lin creates off the dribble, finding shooters such as Chandler Parsons -- or Daniels after Parsons fouled out early in overtime -- for outside shots on the wing. But too often this series, the Trail Blazers have kept the Rockets from being the Rockets. Harden averaged a league-leading 6.9 fast-break points per game in the regular season. During the first two games of the series -- both home losses by the Rockets -- he was averaging just 2.6 fast-break points. Whether it was Portland's defensive schemes or his own lack of aggressiveness, that had to change for the Rockets to get back into this series. "That's how we have to win. Me and him have to be dominant. We have to always be on the attack," Howard said of himself and Harden. "It starts with us and it goes down to everybody else. But if we're not attacking, if we're not being dominant, we can't expect anybody else to do it." Friday's win might not have been the most efficient of Harden's career. It took him 35 shots to get those 37 points. But he was aggressive. Howard noticed and appreciated the effort. The partnership between the two superstars isn't always perfect. They're still working out the best ways to play together. At times, it feels like their games aren't in sync. But they're both so talented, they can win games like Friday's in spite of the inefficiencies if they continue to attack. "We just have to play basketball, instead of thinking," Howard said. "Just go out there and do it." That's how Daniels has been playing since he can remember. As a senior at Virginia Commonwealth University, he once made 11 3-pointers in a game. VCU coach Shaka Smart called him the "the best shooter I've ever coached." He went undrafted in 2013 but hooked on with the Charlotte Bobcats summer league team. After being cut from Bobcats and Rockets training camp, he found himself in the D-League -- the last chance for most professional basketball players with NBA dreams before heading overseas. It's not glamorous. It's barely a living. No Rockets player might know that better than Lin, who assisted on Daniels' game winner. "It's awesome because I know what it's like to be in the D-League," Lin said. "I know what he had to do all season -- grind and work with no spotlight, no lights, nothing, and then the opportunity came and he seized it. He hit a big shot, and I'm happy for him. Everything he's getting, he totally deserves." Whether or not Daniels' shot lifts the Rockets to more than one hard-fought road win remains to be seen. The Blazers were inches from a soul-crushing comeback and 3-0 series lead in this one. Damian Lillard had another brilliant game with 30 points (on just 16 shots), six assists and six rebounds. Nicolas Batum got hot from behind the arc and poured in 26 points. And LaMarcus Aldridge had 23 points and 10 rebounds despite the full attention of both Howard and Omer Asik, who was inserted into the starting lineup Friday in a last-ditch attempt to slow Aldridge down from the historic pace he was scoring at in the first two games. But if Daniels' shot does turn this series, if it ignites the Rockets, it really will be something. "It's big time," Harden said. "A couple weeks ago he was in the D-League, and now he just saved our season." That was ... miraculous: With 11 seconds left in overtime and the score tied, a loose ball ends up in the hands of Troy Daniels. The rookie drains a 3-pointer and Houston never looks back. Basketball doesn't get any crazier. MVP: James Harden's 37 points came on an unsightly 35 shots, but it was his poise (one turnover) and ability to stabilize Houston's offense with a smooth pick-and-roll that kept the Rockets ahead most of this game. X factor: It looks like Houston's much-needed adjustments defending LaMarcus Aldridge paid off. Omer Asik or Dwight Howard spent the night denying entry passes and wrestling him for position. Pick-and-roll coverage varied, and help rotations arrived on time and with purpose. Aldridge made only eight baskets. MVP: Mike Dunleavy. Yes, you read that right. Dunleavy was nothing short of spectacular, scoring 35 points including a Bulls franchise-playoff-record eight 3-pointers. The Bulls needed some firepower in the worst way, and Dunleavy happily, surprisingly, obliged. X factor: Jimmy Butler couldn't hit a 3-pointer to save his life coming into Game 3. While he hit only 2 of 5 on Friday night, one of them was the biggest of the game, giving the Bulls the lead for good. Defining moment: Late in the third quarter, Nene and Butler nearly escalated some incidental contact into a full-blown brawl. Nene was ejected for grabbing Butler's head, leaving Washington without one of their best players down the stretch. MVP: Joe Johnson nailed three treys, shot 64 percent from the field and hit the game's clinching free throws to finish with 29 points. Among the Nets' slew of veterans, Johnson has been the most consistent over three games. X factor: Jonas Valanciunas has been a matchup problem all series long. He finished with 10 points and 10 rebounds, so why didn't he get more than four shots? Despite a seven-point edge in second-chance points, the Nets outscored Toronto by 10 points in the paint. That was ... weird: Before Johnson and Paul Pierce restored normalcy and put the Raps away, both squads combined to miss 6 of 12 free throw attempts in the final minute of the game. Mike Dunleavy, Bulls: Down 2-0 in the series, the Bulls desperately needed a scoring punch. They got it from Dunleavy, who poured in 35 points (including an 8-for-10 clip from deep) in Chicago's Game 3 win in Washington. Nene Hilario, Wizards: Nene, who over the first two games of the series had given the Bulls fits, got himself ejected after an early-fourth-quarter scuffle with Chicago's Jimmy Butler. Nene's availability for Game 4 remains to be seen. For those folks that disagree with my SAnt statement think this: A dynasty definition is a sequential ruler...sorry the Spurs did not win 2xs. "He was in the zone, man. I guess the hoop looked like an ocean to him." -- Wizards guard Bradley Beal, on Mike Dunleavy's 35-point performance in the Bulls' Game 3 win. 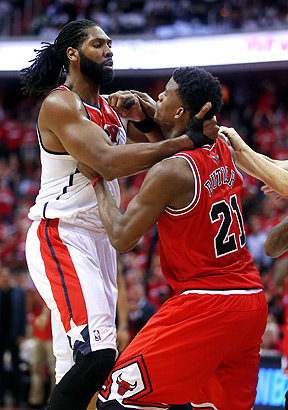 Brian Cassella/Chicago Tribune/Getty Images Things got heated between Nene and Jimmy Butler in the fourth quarter of Game 3, leading to a scuffle that resulted in an ejection for Washington's big man. LaMarcus Aldridge was 6-for-19 (32 percent) on jump shots in Game 3; he was 17-for-29 (59 percent) in Games 1 and 2.